I have SO MUCH KALE in my garden! Michael’s mom suggested we try a recipe for kale chips with nutritional yeast sprinkled on top. I’d never had kale chips before and she was gushing about how delicious they were. I decided to give it a try. Line a baking sheet with parchment paper. 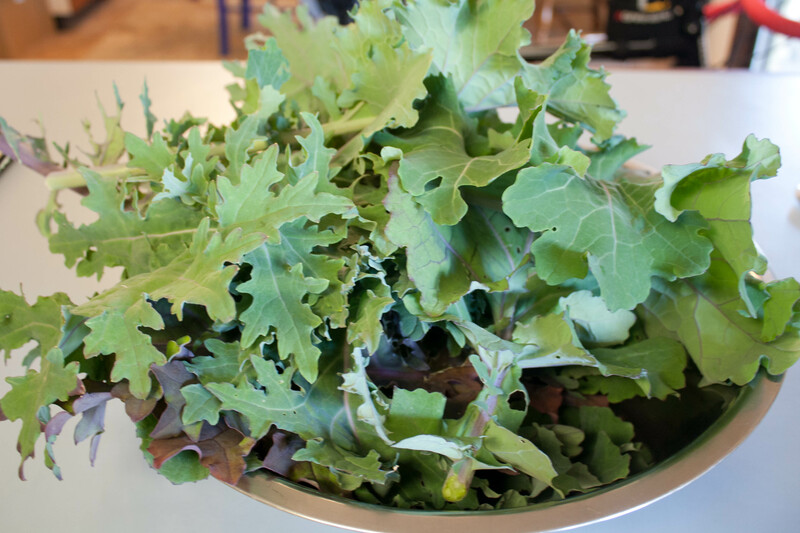 Tear kale into bite sized pieces, wash, shake dry and place in a bowl. 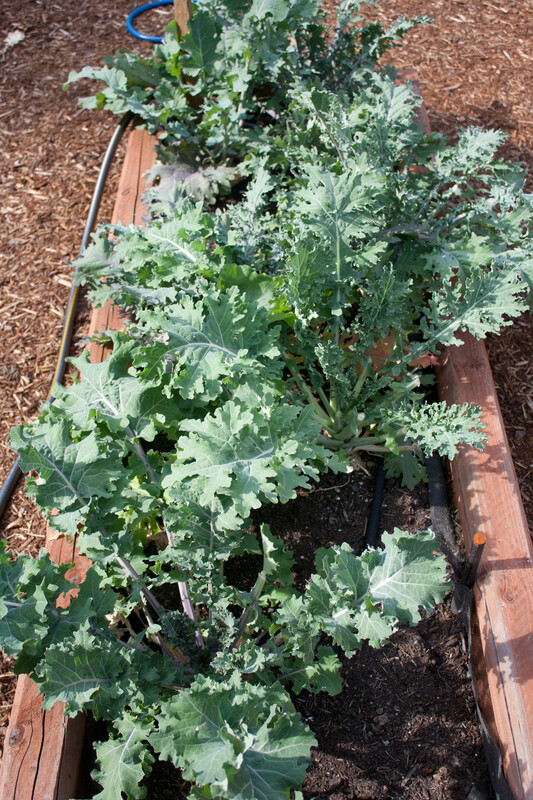 Spray kale with olive oil OR use a measured 1 tbsp and just mix to coat all the kale. 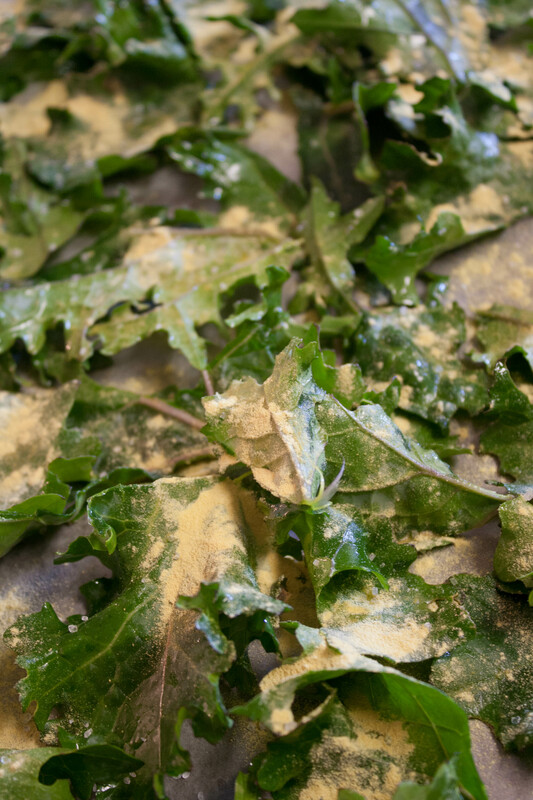 Place kale on baking sheet and sprinkle with nutritional yeast and lightly dust with sea salt. Place in oven and bake 4-5 minutes, turn over and bake for another 4-5 minutes or until crispy. Be careful, it can burn quickly if you don’t keep an eye on it! Remove from oven when crispy. Enjoy! It was a decent sunny day and I went out to our garden to harvest a bunch of kale to give it a try. I might have gotten distracted while I was outside when I discovered a gloriously red strawberry! I am so glad I transplanted the strawberry plant into a huge pot so it’s tripled in size. 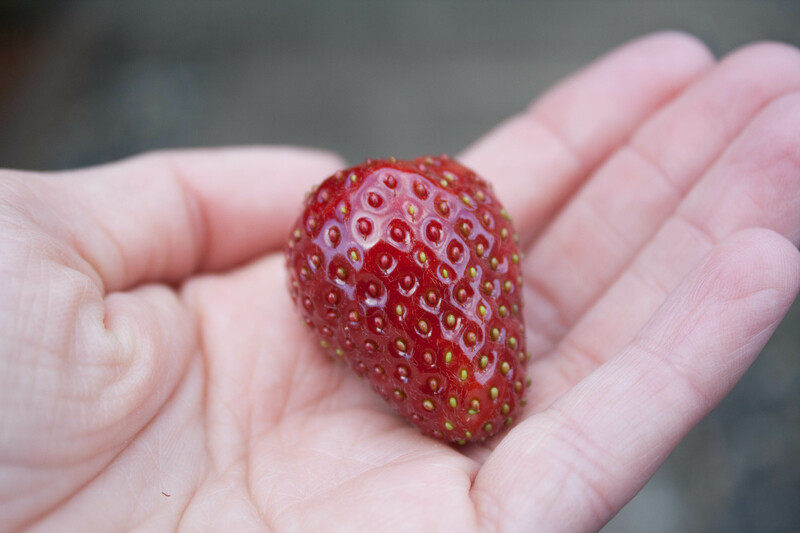 The strawberry was sweet and delicate, very different from store-bought. 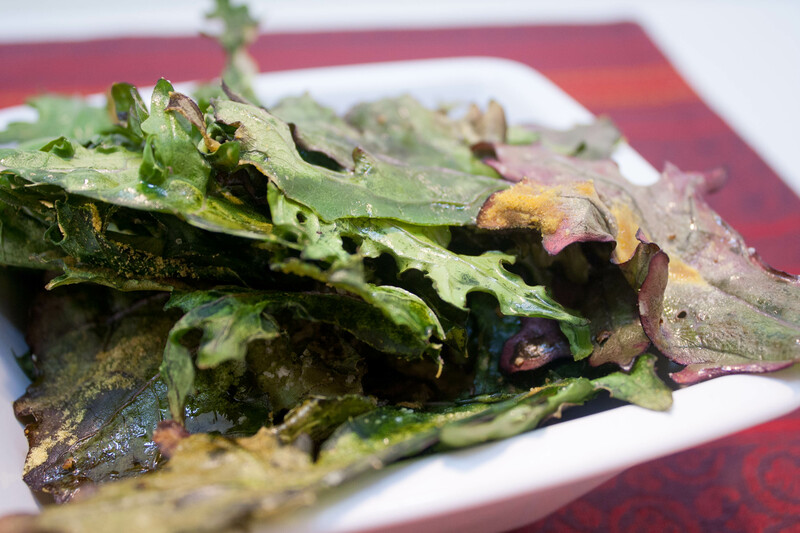 I spread the kale onto my baking sheet covered in wax paper. Then I sprinkled a thin layer of sea salt, freshly ground pepper and nutritional yeast. I went very light on the nutritional yeast because I wasn’t quite sure how it would taste. Would it be overpowering? Was less more? I took the safe route for my first batch. I baked it in the oven for 4 minutes, checked them and they looked great, and then turned them over and popped them back into the oven. I baked it for about 3 minutes and then tried to broil it for the last minute or so. Michael’s mom suggested it, even though the recipe did not. Ahem. It kind of failed. The first batch ended up in the garbage in a smokey mess. I tried again, even though I was frustrated (have I mentioned how much I hate using the broiler?). The second batch was much better! Seriously, while making kale chips and using a broiler, do not leave the room and do something else! How were they? Delicious! I LOVED the nutritional yeast. It was cheesy and garlicky at the same time. The sea salt was a good addition. I erred on the side of caution and probably could have cooked the chips for a teeny bit longer. Some of them were not crispy at all (probably 20%) but the rest were as crispy as a thin tortilla chip. Next time I will make sure they all get crispy and I will add a lot more nutritional yeast. AND I will make a bigger batch because it’s gone in no time. Yum, yum, yum! It was a good snack before dinner. 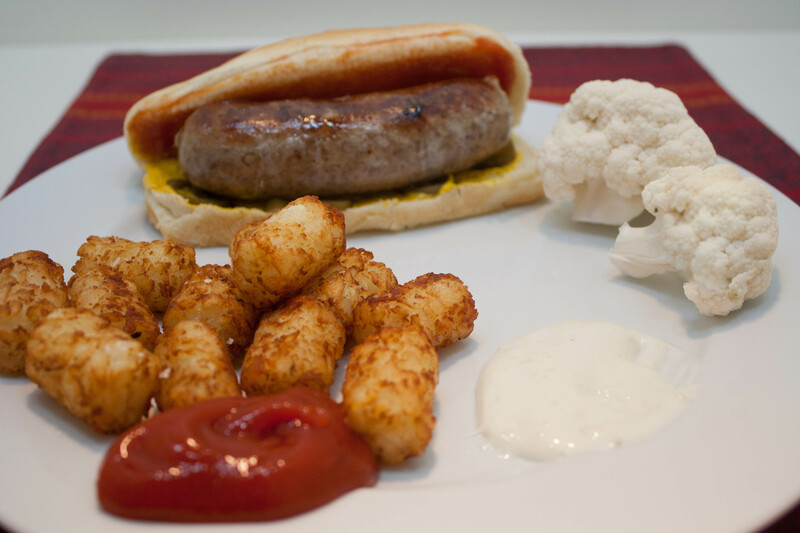 Dinner was a bratwurst with a serving of tater tots. Dinner was good and quick–which was needed after my do-over on the kale chips. I through in some raw cauliflower with a little bit of blue cheese dressing as a side. What I really wanted was more kale chips. I think I’ve created a monster. 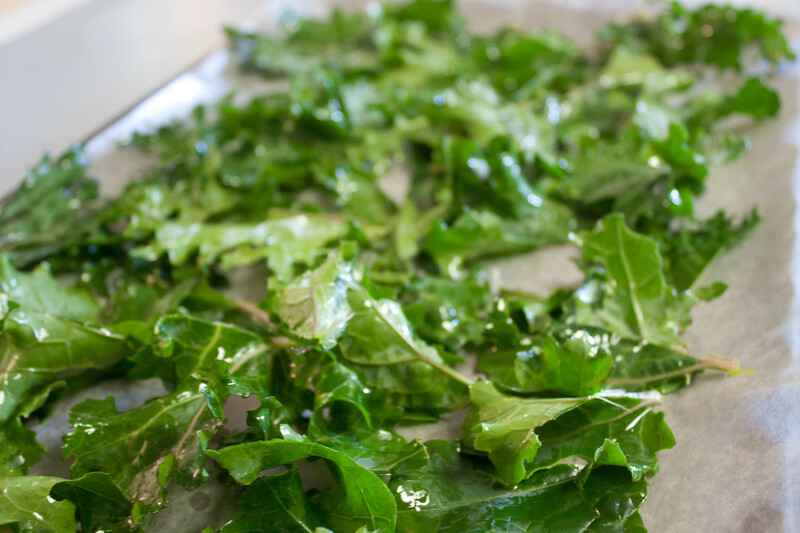 QUESTION: Have you ever made kale chips? Tips? Suggestions? Favorite recipes? I think that subbing grapeseed oil for olive oil would work, you just wouldn’t have the olive-y flavor overpowering it. I have mixed feelings about kale chips, and kale in general. Maybe I just need to cook it more! The first time I ever had kale was on a chicken dish I had a restaurant. It was probably cooked in fat (yum) and had bacon in it. It wasn’t cooked very much so it was kind of leathery. I had mixed feelings but it tasted pretty good. It took some getting used to but then I loved it. And the stuff we have in our garden is great. That’s fantastic that you have access to fresh veggies! It’s like having your own CSA. The recipe is really good. I’m already thinking of other seasonings to try. ha! Yes it’s EXACTLY like having my own CSA! Problem is that I get soooo many different veggies there isn’t enough time or appetite to prepare it all! I bet! That’s one of the reasons I haven’t done a CSA. I eat a lot of vegetables but I don’t know that I could be very creative with the ones I can’t identify! For what it’s worth, I do think the Lacinato (Dinosaur) kale makes the best kale chips. It’s usually a little more substantial and has more surface area. Now that I think about it, I don’t use the broiler at all when I make kale chips. So addictive – yum. I will look for those. I’ve seen some at Trader Joe’s but they never appealed to me. Now that I’ve made my own I love them! I love kale chips. I always use grapeseed oil and a sprinkle of Cajun seasoning. I put them in a 350 degree oven for 10 minutes and they are usually perfect. If not another minute is ok too. I have not graduated to a kale only salad but I’ve started mixing it half and half with romaine for salads and it is very tasty. Your way sounds delicious! I will definitely try the cajun seasoning next time and the lower temperatures. I think youve done it. youve found the way my HUSBAND MIGHT EAT the kale chips!!! Thanks for checking out my site, Sharon. I think it’s great that you are close to your goal weight and seeing maintenance in your future. I hope you can find some helpful things on my blog! 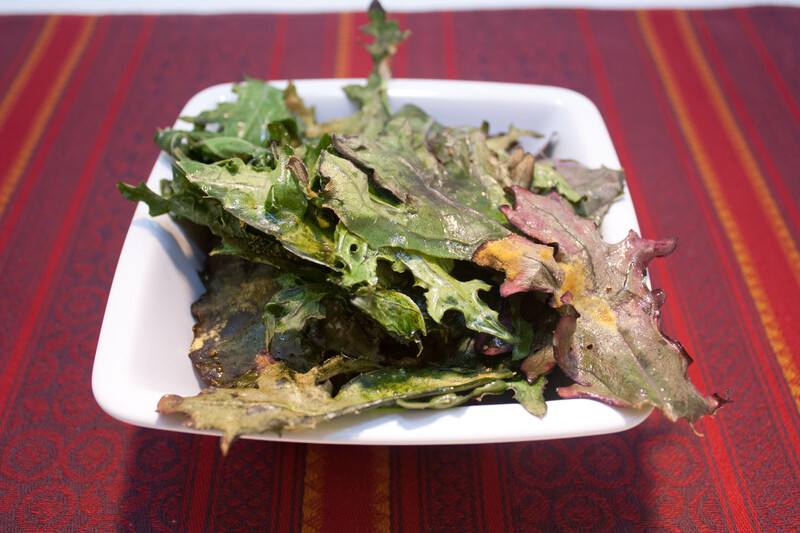 Can you believe I’m a blogger, and yet, I have not yet made the ubiquitous kale chips? Though if I had kale in my garden, like you, I surely would have. The nutritional yeast (or nutri-yeast as we call it around here) is a nice touch. I love nutri-yeast and tamari on popcorn, have had it that way since my college vegetarian co-op days. You and me both. Last week’s attempt was the first time I’d even eaten them, let alone made them! It was quite enjoyable and I see more chips in my future. My boyfriend’s mom gave me another recipe to try that uses cayenne pepper. Mmm! I swear, I really want to like Kale chips. I. Just. Can’t. There, I said it. I love kale in my nutribullet. They are not for everyone but these are pretty damn good!